We would like to hear your opinion about our company, about this Web page, about our products and services. If you have questions about our products or services, we would be very happy about your complete contact details (name, address, organisation). Of course, all contact details will be treated strictly confidential. The company PA Partikel-Analytik-Messgeräte GmbH has its headquarter in the city Frechen west of Cologne. Located right by the railway station in the district Königsdorf, we have good public transport connections. From Cologne main station please take the commuter train S12 or S13 to Frechen-Königsdorf. The big brick building of the industry and technology park (GTP) is directly opposite the station. The Entrance of the company PA Partikel-Analytik-Messgeräte GmbH is located on the head of the building. Take the western motorway ring of Cologne (A1). Leave the motorway at Exit 103 Köln-Lövenich. Please follow the federal road B55 (Aachener Straße) out of town in the direction of Köln-Weiden and Bergheim. Please follow this road until the railway station Frechen-Königsdorf. Please turn left at the first crossing with lights behind the station (Augustinusstraße). Immediately after the brigde over the railway is the entrance to the industry and technology park (GTP). You can find the parking next to the building. 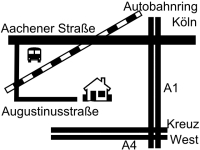 From Cologne/Bonn Airport station please take the commuter train S13 to Frechen-Königsdorf. Of course you can also drive by other railway trains to Cologne central station and change there in the lines S12 or S13.